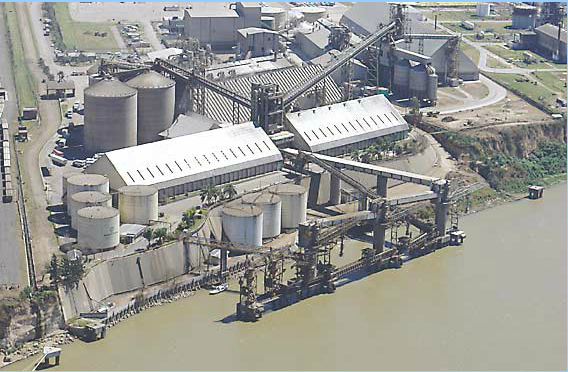 Private Grain Terminal owned by Vicentin SAIC, inaugurated 1987. Vessels berth on 4 dolphins, berthing frontage 140 m with outlying mooring dolphins 95 m ahead, 60 m astern. Depth alongside at datum 12 m (39 ft); air clearance 24,5 m at datum with loading arm in horizontal position. Cargo transferred from flats/silos by two conveyor belts to overhead loading gallery which supported on three reinforced concrete towers stepped adjacent to dolphins. Towers fitted with three multidirectional loading arms having vertical chutes and fitted with mechanical trimmers. 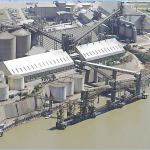 Maximum loading rate grain 1200 ton, by products 700 ton per belt and can load two products simultaneously. Berth fitted with 2×6´´/10´´ pipelines for loading vegoil, loadrate 800 TPH and vegoil also loaded at adjacent Akzo Nobel berth via 1×10´´ pipeline. 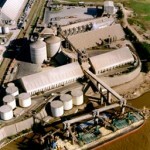 Terminal storage grain/pellets 234.000 ton, vegoil 28.700 ton, and 3 x 4500 ton deposit for bio-diesel storage. Reception from trucks 1400 TPH. Parking space 180 trucks plus additional adjacent space. 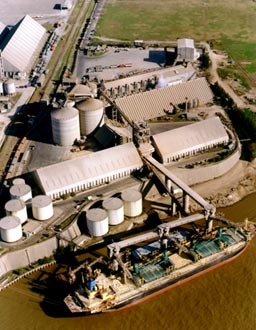 Berth also has good barge discharging facilities on its inner side where whole convoys of barges coming from upriver ports can be accommodated, grain/pellets being discharged via two suction units onto conveyor belt fitted on South end of berth. Bulk sulphur for adjacent Akzo Nobel terminal also discharged at this berth using one grab on fixed arm (or ship´s gear with grab), to hoppers placed over above mentioned conveyor belt and on series of additional conveyor belts. Bunkers via truck only, subject Vicentin’s authorization. Annual exports for grain/by products and vegoil abt. 5 million tons.